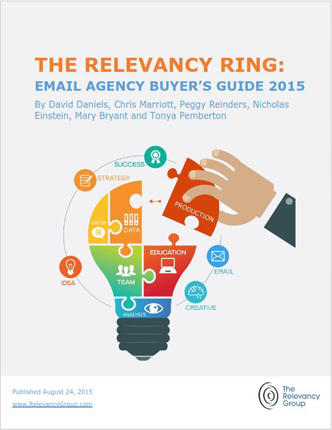 BOSTON – Aug. 24, 2015 – PRLog — The Relevancy Group, a leader in email marketing research and consulting, today released its first ever The Relevancy Ring: Email Agency Buyer’s Guide – 2015. The research analyzes seven email marketing agencies, four Independent Agencies including Alchemy Worx, BrightWave, Merkle and Trendline Interactive and three that are divisions within ESPs (Email Service Providers) including: Acxiom Impact, Epsilon and Yes Lifecycle Marketing. The report sheds light on which agencies provide services that improve the ROI of current email marketing technologies. The Relevancy Group partnered with a new non-profit foundation A Chance in the World™ to create the analysis criteria for the report. We challenged all of the participants to come up with a detailed communications plan for the non-profit including strategy, analytics and creative ideas to increase donations and engagement with the foundation. The Relevancy Group and one of the foundation’s founders, Tonya Pemberton, evaluated these “pitch meetings.” This research was conducted over a period of four months. An excerpt of this research is featured in Issue 7 of The Marketer Quarterly, a digital magazine that is free to subscribers with registration at www.marketerquarterly.com. The report can be purchased on The Relevancy Group’s website www.relevancygroup.com. I am thrilled to announce the launch of a new research and publishing product to further educate and collaborate with the digital marketing community. These offerings expand The Relevancy Group with talented tenured experts and new deliverables to assist marketers to overcome challenges and realize new opportunities. Announcing The Marketer Quarterly, LLC – The Marketer Quarterly is a digital magazine that will publish each quarter beginning in January 2014. The publication will be accessible on a desktop, mobile web browser and on all popular tablets through forthcoming apps for Apple iOS, Android and Amazon. This ad sponsored digital magazine aims to guide marketers through our connected society. With the highest quality content, this publication will feature research and tactics and most importantly topics about managing the life of the CMO, organizational strategies and the notion of empowerment. Learn more about the content here. This all would not be possible without this stellar team. Leading the editorial voice and wrangling the production operations is long-time industry journalist, writer and editor Dianna Dilworth. Covering marketing for more than a decade, I am delighted to have Dianna in the role of Editor for this publication. Cover content subject to change. Tenured marketing sales expert Jason Simon, will be leading the sales and customer relationships. Learn more about The Marketer Quarterly team. 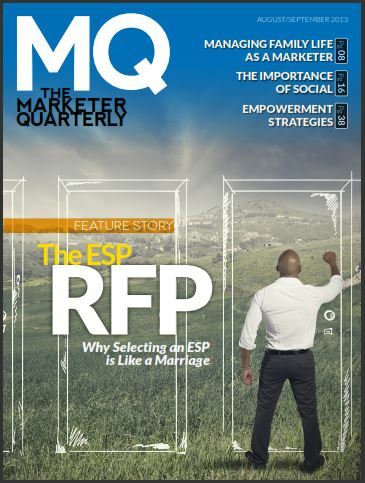 While this magazine will live as its own entity, The Marketer Quarterly will feature research and writing from The Relevancy Group including contributors such as Chris Marriott. The Relevancy Ring is a research methodology to evaluate and compare vendors to their competitors. Developed by The Relevancy Group’s CEO David Daniels, who was part of the team that developed JupiterResearch’s buyers guide “The Constellation.” While at Forrester Research, David was a contributor to their vendor evaluation tool “The Wave.” With over a decade of experience in market research and vendor evaluation, David thought it was time to re-invent the buyer’s guide by focusing more on the experience of the vendor’s customers. The first edition of The Relevancy Ring will cover ESPs (Email Marketing Service Providers). I and the combined growing team look forward to bringing objective vendor evaluations and a new way to discover and interact with the entire digital marketing community. As always, I am David Daniels and please feel free to message me directly or speak with one or more of my very capable team members. Looking forward to delivering these innovations in market research and publishing to help the marketing executive realize their goals across channels.